Liriopes – What makes them great! If you are looking for a strappy leaf plant that is tremendously versatile and exceptionally tough, you can’t go past Liriopes. From bitterly cold areas to tropical locations, Liriopes with tolerate them all. Pink Pearl™ Liriope is a very tough, very compact variegated Liriope. Its green and cream variegation gives an elegant contrast and it’s addition of vibrant pink flowers make it a beautiful garden plant for borders or mass planting as a ground cover. This very compact form has clean foliage and copes well with full sun heavy shade extreme cold and frost, drought, coastal conditions and humid conditions. Pink Pearl™ Liriope only grows about 25cm high and 25 to 30cm wide and gives foliage interest all year round especially for shady spots where nothing seems to grow. Just right® Liriope is a much better alternative to the popular Liriope Evergreen Giant. Just right® Liriope‘s foliage burns less in the sun or in frost and its leaves simply feel stronger and more robust. They are actually double the width as seen from the edge of the leaf. Just right® Liriope‘s leaves are also finer, making the clump look dense and compact. Just right® Liriope is a consistent lower height which is very important for mass planting. Evergreen giant is no longer a stable variety, with many different forms being sold throughout Australia. In full sun, Just right® Liriope doesn’t yellow like Evergreen Giant and in shade it sits much better. So if you’re looking for a green foliage plant for heavy shade to full sun, give the most evergreen Liriope a go, Just right® Liriope. Just after winter Amethyst™ Liriope has great green foliage but fast forward to summer and it has flowers that sit high above the foliage which is different than other Liriopes. The beautiful long lasting deep purple flowers are a real hi-light. Amethyst™ Liriope also has an excellent foliage form producing semi compact dark green clumps. There are other Liriope available that also have good deep purple flowers but their foliage is very flat compared to Amethyst™ Liriope and their flowers are shorter. Amethyst™ Liriope is a nice clean plant that performs well all over Australia in full sun to heavy shade. It grows about 40cm wide and high and tolerates most soil types. In colder areas it’s worth cutting it back at the end of winter. Have you ever heard of a white foliage plant. Well Pure Blonde™ Liriope is just that. It’s a great plant for contrasting against other plants in shade, or full sun. You’d think foliage like this would burn, but it doesn’t. It stays crisp and clean, unless you plant it in an exposed windy spot. So avoid high windy spots for Pure Blonde™ Liriope. Pure Blonde™ Liriope contrasts beautifully with Black Mondo in the shade. In the full sun, black Mondo is far more fussy than Pure Blonde™ Liriope. So how does it work? If you cut Pure Blonde™ Liriope back to the ground in July, in August it will reshoot pure blonde. It will stay that way for 3 months. Then over summer it turns green. Repeat the pruning each year to have a super contrasting plant for your garden. Pure Blonde™ Liriope works in humid, hot, and even cold climates, and tolerates most soil types, but will look better in good soils. They say blondes have more fun, well with this plant you’ll have more fun. Your friends will be amazed and envious of the beautiful garden it creates. Imagine how beautiful it will be on moonlit nights, or with garden lighting. Two ornamental plants have received industry recognition by winning Gold and Silver awards and critical acclaim from the NSW nursery industry. The plants were submitted by Kenthurst Nursery, a wholesale nursery at Kenthurst, and Ozbreed, a plant and turf breeder at Clarendon. Both nurseries are based in north-west Sydney. The awards were presented at the recent Green Expo Sydney (GES), convened by the Nursery and Garden Industry Association of NSW. The Expo brought together plant growers and suppliers to the nursery and landscape industry, who showcased their wares to garden centre owners, managers and staff, as well as to horticulturists, landscapers, students and the gardening media. The annual awards are made to new plants that show merit and offer something new and exciting to gardens and landscape plantings. Gardenia augusta ‘Ken04’ PBR, which is being sold as O So Fine™, won a Gold award at GES. The plant caught the eye of the judges for its extremely fine foliage and dense growth. This new variety was discovered in Australia. The breeding of new varieties to rival box plant, the traditional choice for a hedge, is a challenge this new gardenia meets head on. O So Fine™ gardenia is a form of Gardenia augusta ‘Radicans’ selected for its dense growth and ultra fine leaves. The new form was noticed as a sport on production stock at Kenthurst Nursery. The odd shoot had very fine leaves (just half the width of normal ‘Radicans’ leaves) and dense flowering. The sport was observed on the stock plant to ensure it was stable before pieces were propagated to see if the fine growth would persist when the plant was grown on its own roots. More than 10 generations have now been grown with no changes occurring to either leaf size or the plant’s dense flowering. 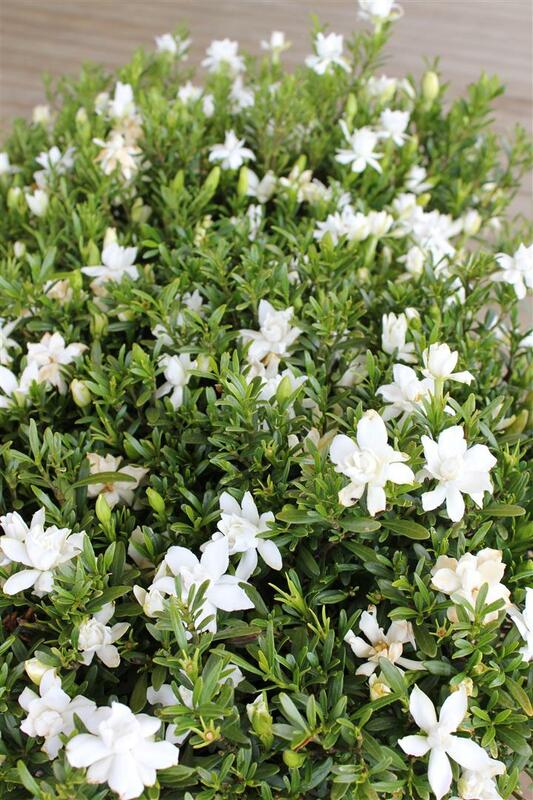 O So Fine™ gardenia is seen at its best as a compact, fine-leafed hedge or groundcover. It grows to around 30cm tall and a metre wide in either sun or part shade. As a bonus, it has a profusion of fragrant white gardenia flowers during summer. The plant’s short internodes (the stem length between the points on each stem that produce flowers and leaves) create the dense growth and give it the extra flowers for its size. It is drought hardy once established, but grows and flowers better with extra water in dry times. It needs frost protection in very cold winter areas. Todd Layt from Ozbreed, who is growing O So Fine™ gardenia, recommends using 1.5 to 3 plants per linear metre for hedging or as a groundcover. The closer planting rate would give dense coverage to quickly choke out weeds. He says this fine-leafed gardenia only needs to be clipped occasionally to maintain its compact habit as a hedge or groundcover. He also says it is an excellent choice for containers including troughs. Alternanthera dentata ‘LRU30’ PBR, which is being marketed as Little Ruby™, was developed in South America. It has been sent to growers around the world including Australia. This bold plant gained a Silver award at GES. 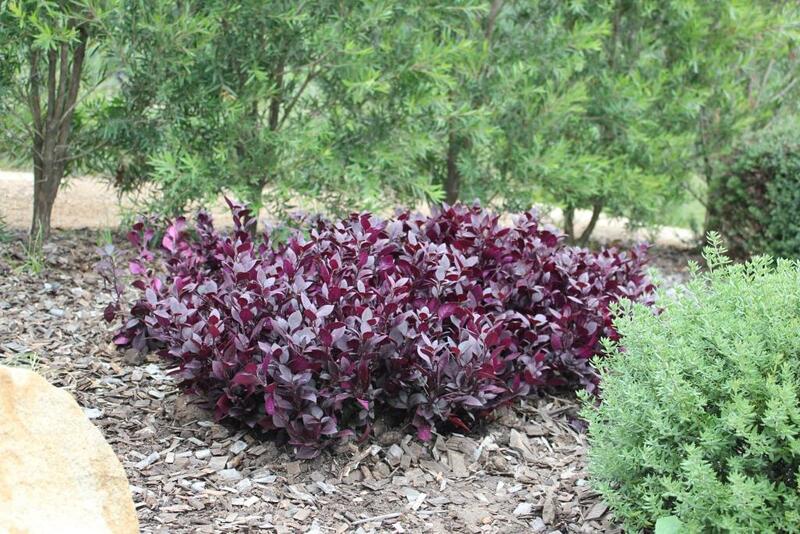 It is a dense, compact shrub with striking burgundy leaves. At around 30-40cm high and 60-90cm wide Little Ruby™ alternanthera is ideal to plant as a groundcover or border plant in sun or part shade. It is also a stylish choice for a low-maintenance container plant. Little Ruby™ alternanthera was selected from a breeding program in Brazil, where it was chosen for its dark leaf colour and compact growth. It is a third the size of common Alternanthera dentata. Foliage plants add colour to gardens all year round, which is why Little Ruby™ alternanthera is a good plant choice for gardeners wanting a colourful low-maintenance garden. It combines well with silver-leafed plants such as westringia, or clumping plants such as dianella. Todd says it has been popular among landscape designers, who are specifying it because of its compact growth habit. For a weed-suppressing groundcover, Todd Layt recommends spacing Little Ruby™ plants about 30cm apart. They can be pruned in spring and, although drought-tolerant, benefit from extra water in very dry times. Plants thrive in areas of high humidity, but need protection from heavy frost.